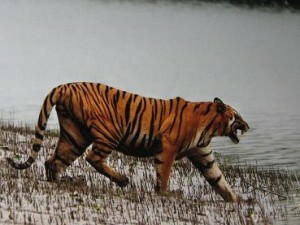 The sight of a tiger in the Periyar National Park had already crowned our tour with golden memories. Cherishing these memories and to add some more to our record we drove to Kumarakom to let loose ourselves in natural beauty. Kumarakom is an enchanting destination of Kerala which is famous for its mesmerizing greenery, rolling hills, aromatic spice, coffee and tea gardens, rejuvenating Ayurvedic massage and the fascinating Kumarakom Bird Sanctuary. Kumarakom, a small village is a wonderful backwater destination which is a cluster of small islands on the Vembanad Lake. Our guide happily told us that he hails from Kumarakom. We were booked in a houseboat for our accommodation in this village. After refreshment I went to the terrace of our houseboat to capture the arresting views of coconut groves, emerald paddy fields and backwaters. While I was enjoying all this I noticed a small bird (black and grey in color) resting on the wooden chair on the terrace. With quiet steps I tried reaching her but the moment she felt my presence she flew away. Anyway it was such a good beginning in Kumarakom. After getting ready all of us set out for a backwater cruise on a houseboat, a much-awaited experience. 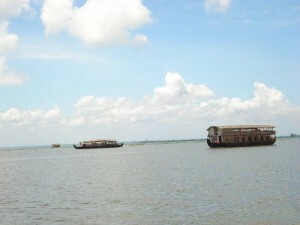 We sailed through the backwaters enjoying the captivating views of the surroundings. It was such a mesmerizing experience. We saw paddy fields, several species of birds, fishermen catching fishes and colorful flowers. 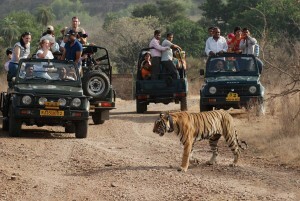 It was an opportunity for us to stay close to nature. While enjoying our breakfast on the houseboat our guide told us that the Vembanad Lake is among the largest freshwater lakes in Asia. It also acts as a balancing tank against floods. After enjoying the cruise we went to the village and interacted with the local people there to know their culture. They were warm-hearted and friendly. I noticed that the surrounding of the houses here were clean and full of greenery which is quite a rare sight in urban cities. Our next destination was the Kumarakom Bird Sanctuary. It is a paradise for bird lovers where we were greeted by sweet melodies and views of the colorful birds. 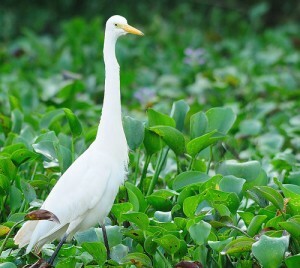 Located on the banks of the Vembanad Lake, the sanctuary is a home to a variety of bird species including the migratory ones. As we explored this gorgeous green sanctuary we saw parrots, flycatchers, wood beetle, teal, larks, owl, egret, heron, darter, Brahminy kite and waterfowl. We were completely overwhelmed with the sights of these wonderful birds. Later we even enjoyed a boat ride in the sanctuary which added more charm to our experience. I thought to myself what an enchanting destination Kumarakom is! The next destination on our itinerary was Alleppy, another wonder of Kerala.